I was all excited! I had just gotten my first ‘real’ speaking contract to speak ‘on a stage’ in front of people that were not related to me!!! As I am discussing the details of the gig, my bubble quickly got burst when the event planner asked me where to send the invoice. I actually had to PAY $200 to speak!!!! Did I do it? Absolutely! Firstly, I was super excited to get a chance to share my message with over 100 people (yes, this looked like a super huge audience for me at the time…) and I thought that it was like a marketing expense to gain visibility. More than a decade later, not only do I make 20 times more than what I had paid that day, for one single talk, I do still speak for free, from time to time. I do believe in this model, sometimes for a good cause, or sometimes as a platform to get services or courses known by different markets. You don’t need to be a professional speaker to speak in public. If you are an entrepreneur, an expert on a topic, an author, you sell a service or a product, you may want to think about developing a short talk on your subject. 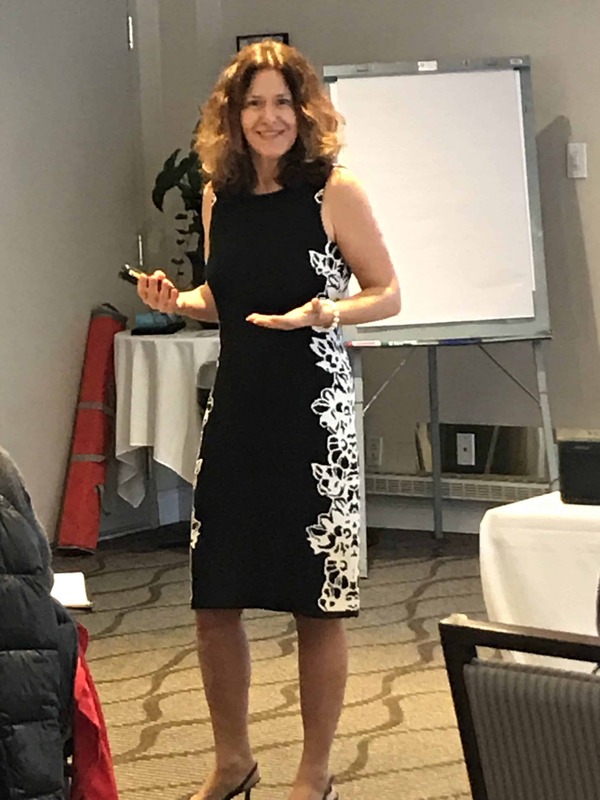 On Saturday, January 26that Granville Island, the Canadian Association of Professional Speakers hosted Karen McGregor, bestselling author, international speaker and the founder/CEO of the Speaker Success Formula. Her company helps entrepreneurs to monetize their expertise by creating a powerful talk and offer. Her flagship program, Rock the Stage, is known Canada-wide as the go-to speaker program for entrepreneurs who want results now. This single mom with sales of a half-million dollars annually taught us how the “speak for free” model can be as fulfilling, lucrative and impactful as the “speak for a fee” model. Keep reading if you want to understand how to create a talk that not only educates and engages but also sells your program, products or services with ease. If you want to learn tools to sell from the heart without feeling manipulative, pushy or salesy, or simply if you want to get ideas to create an entire product suite that your clients want and need. Here are my notes from her session: How to Make Money with Your Message, Sell from the Heart, and Create Products that Rock! Karen moved to Vancouver 15 years ago and attended her first CAPS meeting, looking around the room and thinking that it was intimidating looking around the room to established Speaking Professionals. Karen really appreciates people who think differently. You are allowed to sell your services. Ideally 75 minutes and at the end of the talk, you are able to offer your programs or services. Focus on ONE thing that you will be known for. Be the ‘go-to’ person for ONE thing. Choose one program. How often do you need to speak in order to earn a 6-figure income: Twice per month. It allows you to have a life that is not dictated by other people. When they consume your program or service, at least 30% of the people consuming your program, will continue to work with you. Better to have a small number of long term clients, then a massive amount of people for a long time. You travel as much as you wish and decide where you want to accept contracts. The speaking gigs are free and most speakers charge for their services. So you get more opportunities and contracts. You only need ONE talk and then adjust it and use it for the next 10 years. Just tweak it. You can make lots of money with your programs. Karen’s program is $2000. When you get to sell from the stage, you get benefits and use it as your paycheck and you can even reward the event’s planners financially when you sell your programs. You can make mistakes speaking, as long as your systems are. The delivery is not as important as the design. You need a proper structure for your talk. You can be a great speaker and get hugs but not credit cards. If you are structured well, then people give you their credit card at the end of a talk. Yearly income = $132,000 or $264,000 for 2K products. Karen’s son is 20 years old and uses her model and makes that kind of money. Private coaching and retreats (client pays a premium price for your personal time). The talk is more important than the offer. During the talk you want them to already want to believe that they want your services. The selling is part of your talk and not just a ‘selling-time’ at the end of your talk. What is the problem? People are at the symptoms level. What is the problem that needs to be fixed? The first symptom in our field is ‘getting hugs and not credit cards’. Sometimes they don’t have the system. People listen to you because they have a symptom that you can get rid of. Even if people are coming to you, even if they know it is important, you want to make sure to reinforce what are the benefits of solving that problem and make them agree to it. It will make them lean in and listen carefully. 3rdcore element: Intro to the main Theme. What is the real problem, behind the symptom? What is the real thing that needs a solution? Karen’s real problem was not that she was not making any money, it was that she did not have a system to speak. She constantly wanted to become a better speaker. Instead, she should have placed her efforts into creating a system to be successful at speaking. We need to include in our talk the fact that we are generating results with what we do. How do you introduce this elegantly? Your personal story is that the story that sells positions where you were, where you are now and that other people can get there too. Your results are really important to this story. When did you have your ah-ha moment? What happened after that, that really positioned you as the expert and the go-to person for their problem. People only want to work with us if we have results. Our world is fast-paced and demanding results. By doing this through a story, it positions yourself without sounding salesy. A lot of people are afraid of giving too much content. They think that they will not make a sale if they give too much content. It is not about how much, it is how you position it. You NEED to have good content in a free talk. You must have good content. You have to give content and position it well. 6thcore element: Testimonials and case studies to overcome objections. We sometimes fear the testimonials and case studies as they don’t want them to be seen as salesy. Use them as an extension of the content. When you show a testimonial, find what is the defensive thought in your audience’s head and show with a testimonial of your client’s results that counteracts what their objection was. When you offer people stories about your content, show them video stories too. The testimonial becomes support of the content. Ideally, use videos of people that have had results. In Karen’s example, she showed us how a client used to sell $197 package and switched to $2000 and $4000 packages and made a killing after working with Karen. Steps to consider in order to develop your offer. How to sell from the heart? What is your state going on to the stage? Are you hoping people will buy? Or are you hoping people will be transformed and want to continue to work with you afterwards? We grew up with a certain perspective on selling, brought by our society. You can’t make a difference if you don’t sell. People will not remember you in a few days if you are not taking them to the next step. Your offer HAS TO be part of your talk. Selling is not separate from your talk. They are going on a journey with you. An offer is an invitation. A strong offer will consider your clients’ blocks and limitations. It doesn’t help anyone to not bring up the fears and limitations. What can be the top three objections for your product? Money often comes up and it is usually our own belief. We think that people will not buy and that is what happens. If you position the objections properly in the talk, then the money doesn’t get a problem. If you give enough reasons in the talk for doing this and give enough value, you don’t need to defend the price at the end. Go in with a different energy. Remind them of long-term results. Over a period of time, what is this skillset worth to you? What is your time worth? Time is also an objection that comes up. You want to address the time saved when buying your offer. What is it worth to your family and yourself and your business? Make sure that part of your offer addresses the objection. In your offer, don’t just sell your small $49 thing. Include these things in your package as ‘objections dissolver’. Use them as a gift included in the package. Example: Little 3 videos on the main time-savers, 10-week online program to do XYZ which is their objection. Relationships focused peope want to be involved and belong. Information-based people want numbers, you want to give them the price of your program soon in the talk, don’t wait until the end. Also, watch your language and don’t use the word PRICE, use the word INVESTMENT. Process-based people want to know that you have a system. Action-oriented want to know and be reminded that they will get results quickly. When they do their first deposit, they get the first module right away. You want to have an online program or something to give them right away in the package they buy. You want to include all of them in your talk. The package has to appeal, not only to dissolve their objections, it needs to fit their lifestyle. In your Wholistic package, Mix on online coaching and one-on-one sessions. Some prefer direct contact with you. Recording of the live event or other cities. A Facebook group where people can connect. If we can sell for other people, why can’t we do it for ourselves? Once you experience consistent results, that you expect to get 10% or 20% of your audience buying your product, you get confident and you don’t let the ‘no’s’ affect you. You know your stats and you know that is what you get. Position yourself in the present. Avoid the ‘go home and think about it’. When your talk is over, energetically, they are in the best state to accept your offer. You don’t get the other add-on value if you don’t get right away today. What is unique about your training, product, program? How does your offer solve a problem beyond the talk? What cannot be solved in your 1-hour talk that you will solve with this program? Clear benefits – what do they get? Have really clear information and show the benefits connected to you. What unspoken objections does the audience have? How do you address these objections through the delivery of your offer? What additional programs, products or services would give the audience an incentive that you can include as gifts part of your offer? Have 2 to 5 incentives. Create products and services that eliminate the objections. Case Study and Testimonials that eliminate objections. Include 2 in the bulk of your talk. Include proof of the value of your offer. Offer guarantee (conditional). Karen offers a full year guarantee. But you have to show her that you have done all the steps that she has included in your program. Options for dates, cities, payment plans. Have lots of options. You can even offer a deposit (non-refundable) that includes an online to start and then they can pay the rest later to get the rest of the program. If they still say no, then you know it is not the right client for you. They may not be a good fit for you. Make sure that your audience finds the right Mentor. More likely, people that are likely to hire you may already be working with someone. They may already have a coach, a trainer, a mentor, etc. Just ask them: Do you have the results you want right now, yes or no? Never suggest they stop working with the person they are working right now, just ask them if they have the results they want. Karen’s ethics would never allow telling someone to work with their actual coach. Start having lunch dates with people that are your ideal clients and listen to what they are complaining about. What language do they use? What is their greatest fear? Then develop a product to fix that. They can include online programs, retreats, online coaching, multiple-day events, experience of many days (retreats), exotic location experiences, private coaching. It is better to do multiple days as it is the same work to do 1 day vs 3 days. Real transformation will happen in 3 days. Have one core program you are known for. Make sure to include the next step for your clients. long-term offer. A combination of training. Make sure to offer on-going support, when they need it, at the time they need it. That is where the value comes in. Get something exclusive to offer, private experiences.sYou can listen to her webinar: “How to triple your income through speaking.” https://www.speakersuccessformula.com/videosScroll down at the bottom of this link to find the link to access the video.